Well, this is a change-up. 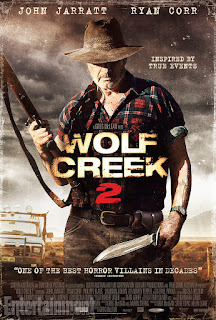 So I really liked Wolf Creek. It's a sort of, Texas Chainsaw Massacre-y gore feast. Mick Taylor (John Jarrett) was utterly terrifying as the lone mass murderer in the outback. It was great. And I'm always worried by horror sequels. Wolf Creek opens with Mick, once again played with excellence by John Jarrett (Django Unchained / Australia), taking down two traffic cops. No spoilers, but they sort of deserved it. It serves only to re-introduce Mick, and remind us of his brutal nature. We hit the opening credits, and then the rest of the cast. Starring Ryan Corr (The Water Diviner / Where the Wild Things Are), Shannon Ashlyn (Devil's Dust / Dripping in Chocolate), and Philippe Klaus (Thicker Than Water / Home and Away) the film veers into a different direction than the first. The first was set very much in a single location - Mick's farm - where he takes a group of young people to pieces. Kind of literally. This movie plays more of a road movie. It's very reminiscent of The Hitcher. Don't get me wrong, it's good. However, the "teens" for lack of a better word, run a relay race, passing the "victim" baton between them. It makes for a fun film, fast paced, and across several locations works, but you get little time to become related to the protagonists. In fact, you could say the movie plays very much in the POV of Mick, the antagonist. The ending of the movie, the last twenty minutes or so, are fantastic. The ending is very unexpected. It ties together well, sequels well, if differently. I seriously recommend it, for those with a stronger stomach. And I see from IMDB the third film is coming.